These Canines Are Ready for Christmas! Everyone knows the classic Christmas song "The Twelve Days of Christmas"—you know, "On the first day of Christmas, my true love gave to me ..."
But, when it comes to Christmas gifts, does anyone really want a partridge in a pear tree? Or a bunch of geese laying eggs? We don't think so. When Christmastime rolls around, there's only one thing people truly want: Dogs. Lots and lots of dogs. 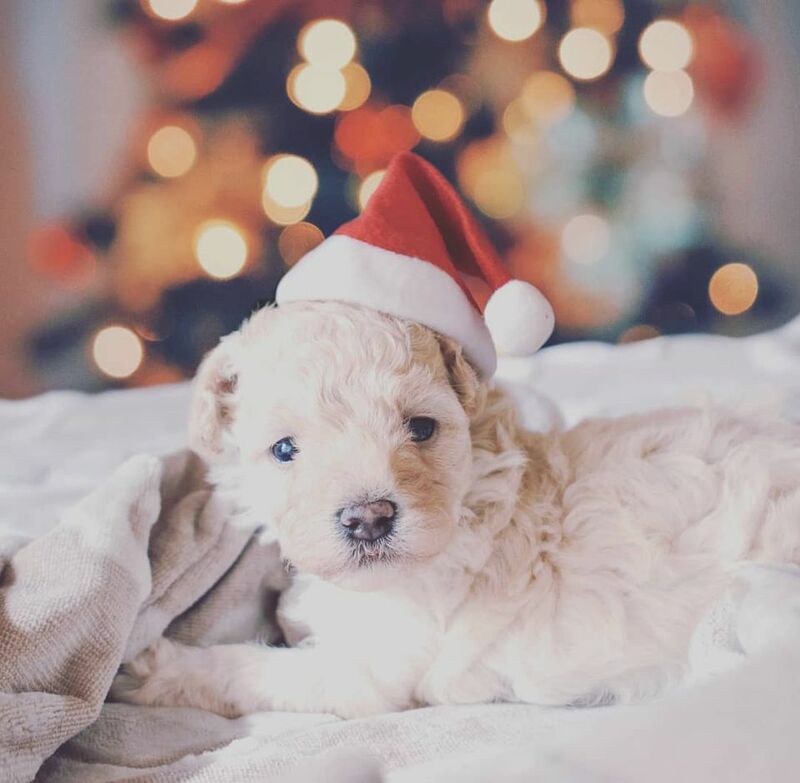 That's why we've rounded up the most festive, Christmas-time-ready dogs and puppies out there. Because who wouldn't want to find one of these cute guys or girls under their tree on Christmas morning? Decorating the Christmas tree is a lot—and we mean a lot—of work. First, you have to untangle strands upon strands of old Christmas lights; then you have to painstakingly assure the ornaments are evenly spaced on the tree; and finally, you have to listen to your mom tell you it's all wrong and do it over. It's exhausting! Pass the mulled wine, please. 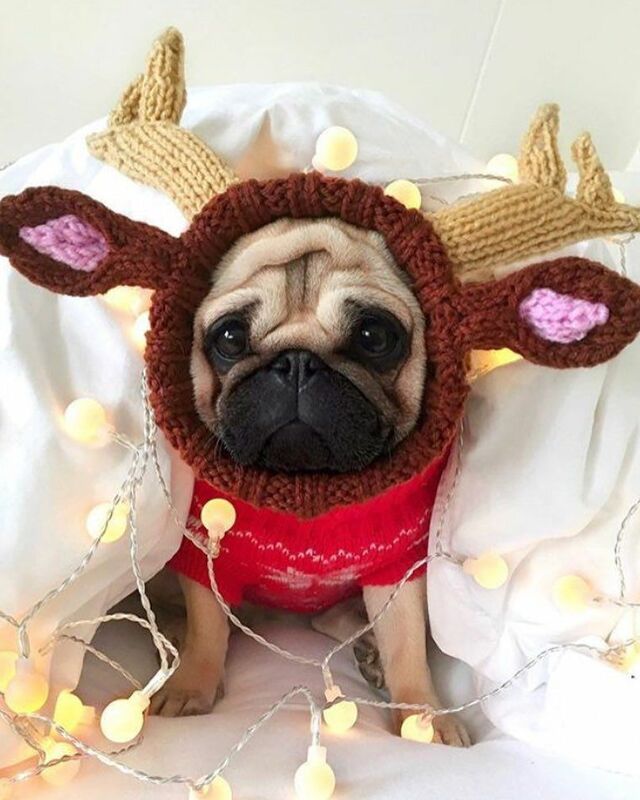 That feeling when you put on your cutest, most festive outfit for the office holiday party and feel like a total Christmas snack... but then you look at yourself in the mirror. Maybe trying to take more fashion risks can be your New Year's resolution, huh? Sometimes, the anticipation of waiting for Santa Paws to show up with all of your new toys is just too much to bear. Just try to stop watching the clock between now and Christmas Day, would you? It's time to gather up the crew and head to this holiday season's ugly sweater parties! Except maybe you forget to invite that one friend who, somehow, actually looks good in ridiculous holiday sweaters. We know. It's not fair. The most delicious Christmas goodies abound at work! From Christmas cookies, to homemade candies, to work-friendly (maybe) eggnog, there's no shortage of festive treats with which to gorge yourself. But when someone announces that the last gingerbread man is up for grabs, you better get to that dessert table quick. There's nothing like showing up to your parent's house for the holidays and immediately being tasked with the world's weirdest chores. Touch up the caulk in the guest room shower? Sure. Polish the banister with wood oil? Why not. Chop an entire mountain of fire wood? Someone's gotta keep the fam cozy on Christmas morning! After braving crowded malls, finishing your Christmas shopping feels so amazing—until you remember you have to actually wrap the gifts, too. Cutting a straight line is hard. Folding sharp corners is hard. Trying to cut tape without letting go of the loose wrapping paper is hard. The bottom line? Wrapping gifts is really, really hard. Our advice: Utilize lots and lots of gift bags. Wear sweatpants (and maybe even a matching sweatshirt) all day long—and the same ensemble two days in a row. Binge watch hours upon hours of cheesy Christmas movies, and only take breaks to find more snacks in the kitchen. Crush an entire batch of homemade Christmas cookies and wash it down with some hot cocoa. Impossible, right? We'll see you on the couch. You know when you go to your hometown bar during the holidays and see every single person you went to high school with? And you're literally the only single person left? So, you stand under some mistletoe and hope Andy, your high school's former running back, will give you a smooch? Oh, no, we don't either. Your mom doesn't ask that much of you. Go ahead and put on the super nerdy Christmas ensemble. It'll make her so happy and she'll probably only take a handful of photos. Hopefully. The holidays are a time for family. Unfortunately, all of that family time can mean super tense, uncomfortable conversations with your distant relatives about world affairs, politics, and the general meaning of life. Our advice? Just quietly sit there, making this face, and remember dinner will be over soon. It's finally Christmas Eve! The holidays can be a hectic, stressful time, but it's important to remember all of the good things you have in life: Family, friends, plenty of food to eat, a roof over your head, and a beautiful, glowing Christmas tree to goofily smile in front of. It's here! Santa Paws came! Mom made another batch of Christmas cookies! There are, like, 8,000 presents to open! It's time to don your Christmas best and celebrate with your loved ones. Just try to take it easy on the ham and mashed potatoes at dinner—you do want to stay awake past 4:00 PM, don't you? Is It Okay to Dress Up Your Dog?